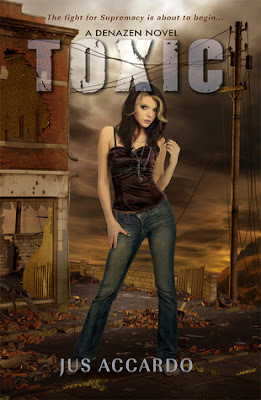 Two Chicks On Books: Blog Tour- Toxic by Jus Accardo and a Giveaway! Hey y’all! I have Jus and Dez here today from the Denazen series to talk about music. It happens to be one of my favorite things besides books! Also I have a giveaway for an eBook of Toxic so make sure to fill out the Rafflecopter at the end of the post! Without further ado I’ll pass the proverbial mic over to Dez and Jus! Anyway… Today I’m here with Dez and we’re going to have a peek into her iPod and see what we come up with. She’s actually got a wide array of taste, so, this should be pretty interesting. Dez? Shuffle away! Powerman 5000 – Make us Insane—My iPod is full of Powerman 5000 because, well, they’re the best band out there! Adelita’s Way – Cage the Beast—Kale and I heard this on the radio. I bought the song because he liked it and it’s grown on me. Motley Crue – Shout at the Devil—MC used to be one of Alex’s favorite bands. Like, seriously. He used to listen to them all the time. He always did have a thing for those weird 80s hair bands… Anyway, some of their stuff just sort of rubbed off on me. AFI – Miss Murder—Awesome beat! The Flys – Got You (Where I Want You)—Tell me this one doesn’t give you chills? Stone Sour –Pieces—This one...yeah. This one is good. Miley Cyrus—Never mind. *Dez blushes and stuffs the iPod into her back pocket* Let’s end with the last song, kay? Ok so I’m back! I love all of Dez’s choices but one sticks out in particular. I love the Fly’s I even met them back in the late 90’s when they first started taking off as a band. My friend’s band opened for them so I thought I’d share their video with you guys! JUS ACCARDO spent her childhood reading and learning to cook. Determined to follow in her grandfather’s footsteps as a chef, she applied and was accepted to the Culinary Institute of America. At the last minute, she realized her path lay with fiction, not food, and passed on the spot to pursue writing. 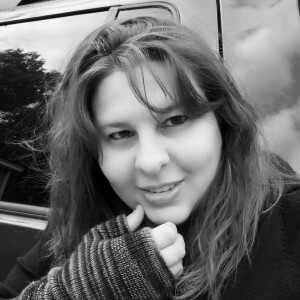 Jus is the author of YA paranormal romance and urban fantasy fiction. A native New Yorker, she lives in the middle of nowhere with her husband, three dogs, and sometimes guard bear, Oswald. Her first book, Touch was released in November 2011 from Entangled Publishing. She is currently working on the next book in the Denazen series. Make sure to check out the Entangled Website for all of the other tour stops! I suddenly feel like my playlists are so tame and mundane! I enjoyed Stone Sour - Pieces, but I am really interested in the Miley song that Dez is trying to hide! Thank you for the giveaway! I do know some of those other songs, though my favorite from it is: Trans-Siberian Orchestra's Believe. My favorite is definitely Miss Murder by AFI. lol. There's no question about that. Got You (Where I Want You) by The Flys For Sure!!! My favorite is Adelita’s Way – Cage the Beast. Never heard of any of those songs!